Dimensional lumber in nominal sizes. Obviously, before you begin the project you should check your local building codes. 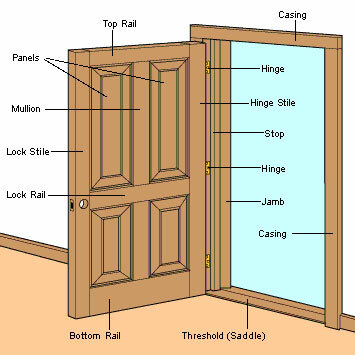 Usually, there are no issues as long as your are not modifying the rough opening dimensions or changing an egress door. Let’s get some jargon out of the way. Most doors are prehung: you buy the primed door, hinges and jamb as one unit, with pre-drilled holes for a lock set and strike plate. 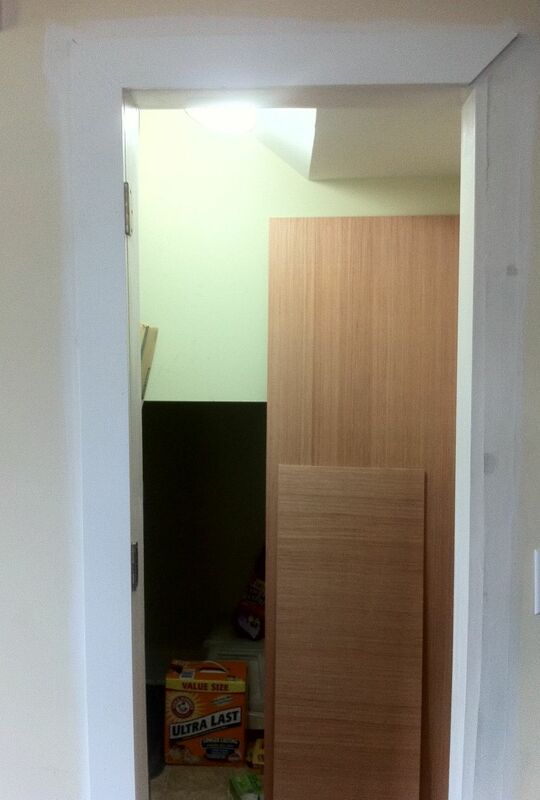 The unit is shimmed into the rough-framed architrave and screwed into place. 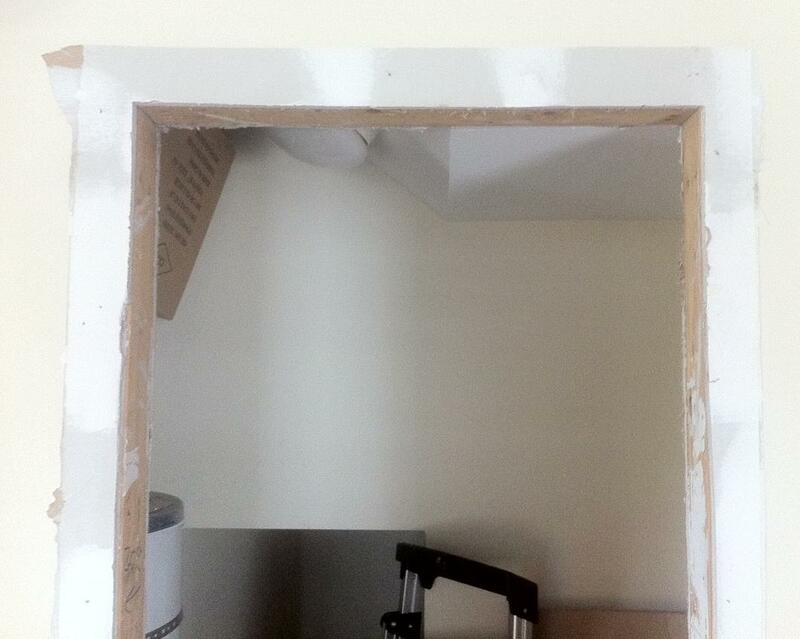 Casing is added around the top and sides to cover the gap between the drywall and jamb. Paint and chaulk to taste. This saves enormous costs in house construction because it decreases the steps needed to hang a door and it decreases the accuracy required for rough framing. The existing door and jambs must be removed. In my case, the door casing is another layer of 1x4 trim-board, nailed into the drywall and studs with 16 gauge finish nails. I saved and reused these boards in the final product. You can see the rough frame in the picture above. I used 1x5 (.75”x4.5”) boards to cover the 2x4s; the edges of the 1x5 are flush against the drywall surface on either side. This rough frame is usually not level, which is the reason that prehung doors are sold with a set of shims. Now is the time to correct that. Luckily, mine was only off by 3-4mm from square, which was within my 1/4” width tolerance. Rebuild the top and hinge-side casing, then patch the drywall on the other side. The bookshelf will have a vertical length of casing attached, which will cover the ~2” clearance needed to swing out the bookcase. 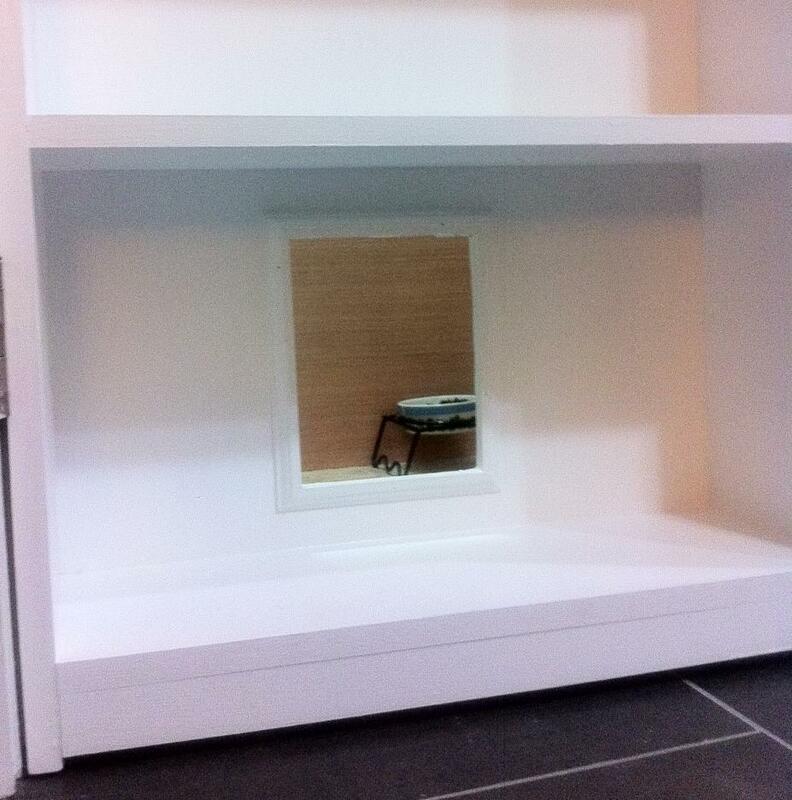 Now you can test the footprint dimensions of your bookcase using a piece of cardboard. I choose a footprint of 23.5”x7.5”, which allowed me to build the entire shelf with 1x8 dimensional lumber. 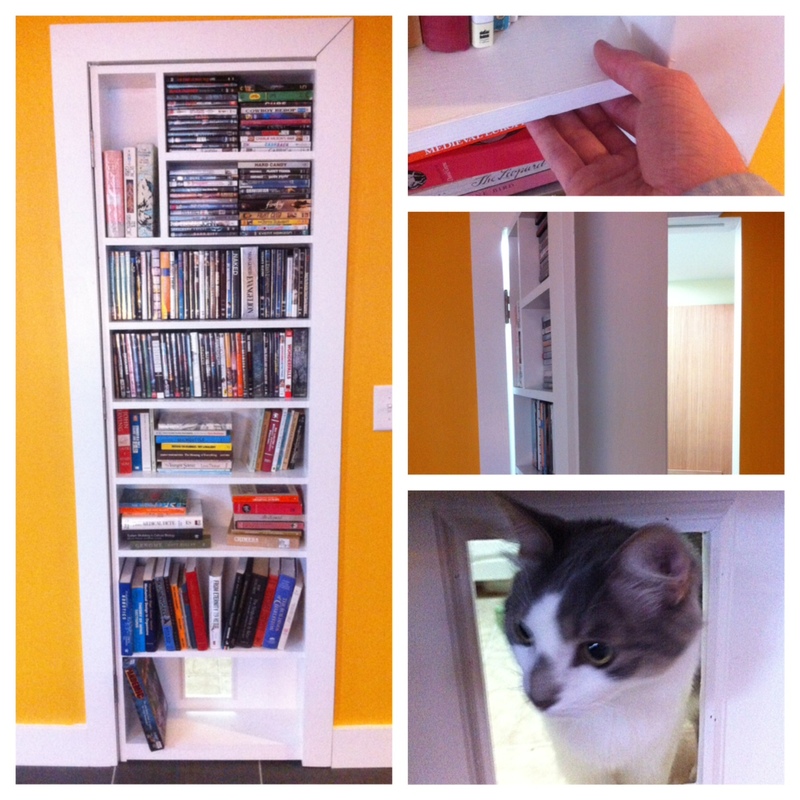 Optionally, you can add a cat door with decorative trim. The bookshelf alone will weight ~50lbs. Even after securing the hinges into the door frame with 2-2.5” inch screws, the hinges can only provide stability and should not be load-bearing. 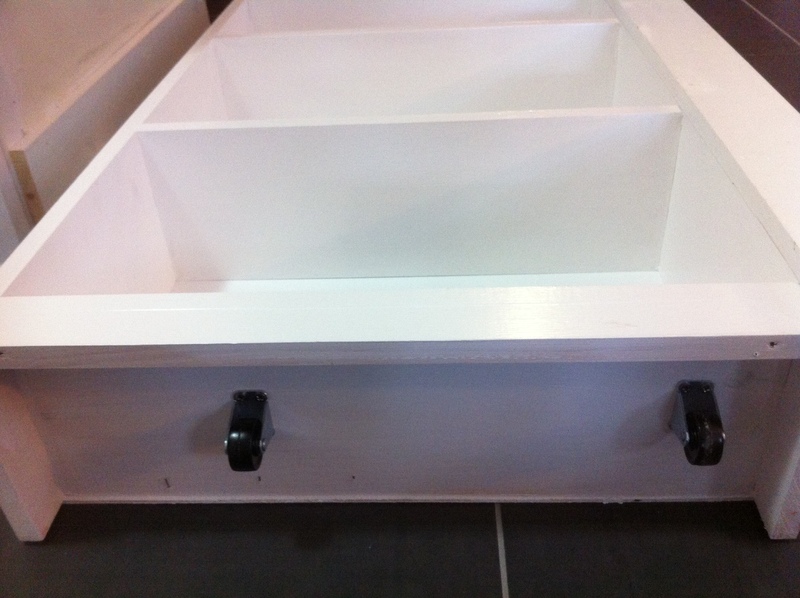 Chisel out the hinge opening and add two rollers under the bottom shelf. As an alternative to traditional hinges, I experimented with ball-bearing swivels on the top and bottom. The swivel design has two drawbacks: the increased vertical clearance is noticeable, and the central axis requires more clearance on the supported side of the door, which cannot be concealed by casing. And although small swivels are load-rated at 300-500 pounds, they are designed for compression, not tensile/shear strain that results from a an off-center load. SOSS and Murphy Door also make suitable products, but at $100-130 per set. 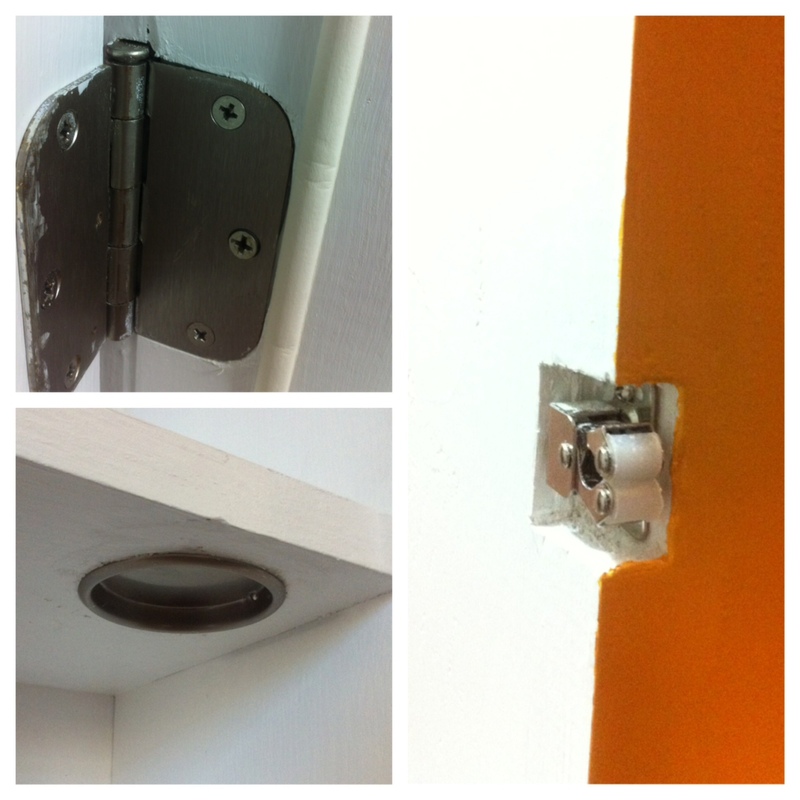 A recessed handhold and cabinet closures add some finish. Carving slots for the hinges and adding a weather stripping tape gives a seamless appearance. 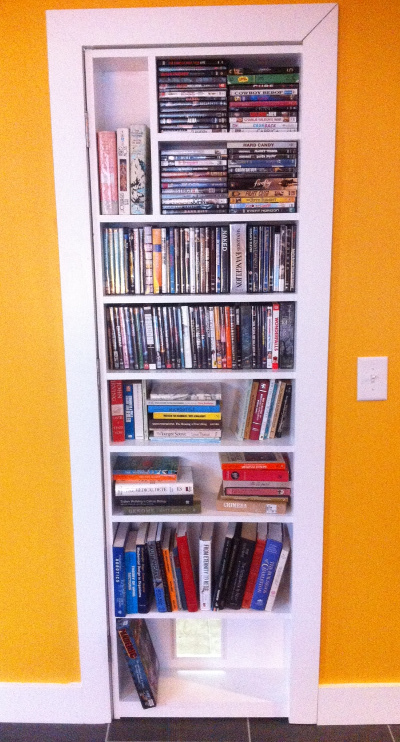 The end result is 14 linear shelf-feet of book space. House framing is a very inexact process. It’s much easier to prime and paint wood before you assemble the bookshelf.